Italian yard Canados has announced that the first hull in its 120 Caesar series is nearing completion at the Rome-based yard. The fully-custom 37 metre yacht, which is the owner's third Canados, is set for an early May delivery. She will spend the summer season cruising the waters of Southern Italy before debuting at the Cannes Yachting Festival in September. It comes after the engines were installed in January this year. The hull and superstructure were joined in October last year. 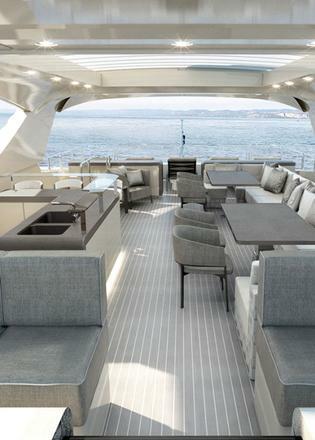 The exterior design of the 120 Caesar has been undertaken in-house by the Canados design office while the interior styling brief was handed to Cristiano Gatto. The owner has opted to replace the usual tender garage aft for a larger beach club. His specification for a five metre tender will also see the installation for a heavy duty tender lift with a 1.5 tonne capacity. 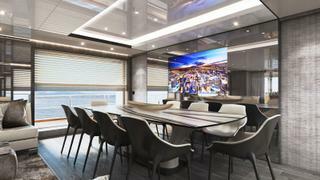 The yacht will also include floor to ceiling main deck side glass walls and a raised pilothouse equipped with navigation, communication and monitoring systems which enable the crew to take control of the yacht from a single position. The boat's interior will feature a selection of marble and wood chosen by the owner. Oversized saloon windows will look out onto the ocean while the galley will be custom made by Italian kitchen designer Boffi. Accommodation is for ten guests in five cabins with the owner's suite, featuring two fold-out terraces, located on the fore section of the main deck. The four guest suites meanwhile will sit down below. Power will come from a pair of MTU 16V 2000 M96L engines developing 2,600hp for a top speed of 27 knots and cruising speed of 23 knots.